Chart of the Day: Public deficits and private savings in the euro zone. "When the government sector runs a deficit, the non-government sector runs a surplus of equivalent size. The government budget cannot be seen in isolation. It must be seen in the light of private and trade sector balances. If the government runs a deficit or a surplus then we need to think about how that impacts the rest of the economy. At the end of the day the books have to balance. Someone's debt is someone else's asset. I'd interject here to emphasise that a build up of debt is not neutral - Harrison seems to understand this but it doesn't yet feature strongly in public discourse so I feel I need to keep saying it. 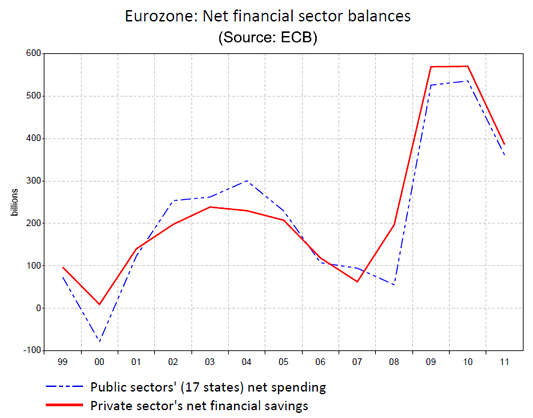 It took me a while to get this, and this is where the Chart of the Day post comes in because it shows the relationship between public sector spending and private sector savings in the Eurozone (the chart is already 3rd hand). Savings gradually fell throughout the 1990s and up to beginning of the Great Recession. 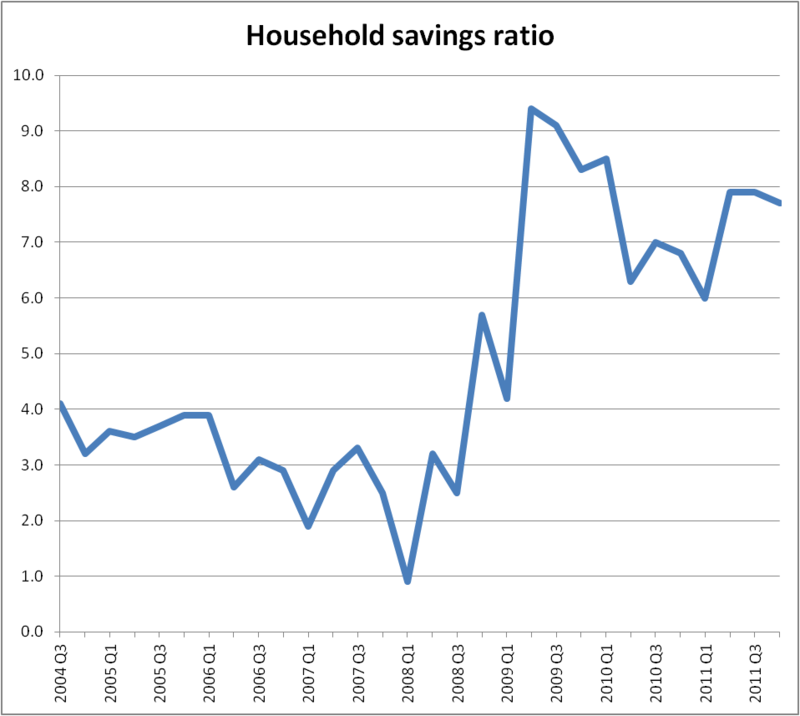 Savings shot up in 2008 and have been gradually, but not smoothly, falling since 2010. Of course the expectation was that the recession would not last. Austerity measures and inflation, and particularly the very low (below inflation) returns seem to account for the decline in saving, but note that it does not seem to be going into spending - presumably it is going into debt repayments. In June the Guardian was commenting: "The amount people are saving has increased at the expense of reducing debt levels, with consumers paying back 7p for every pound saved during the first three months of 2011." 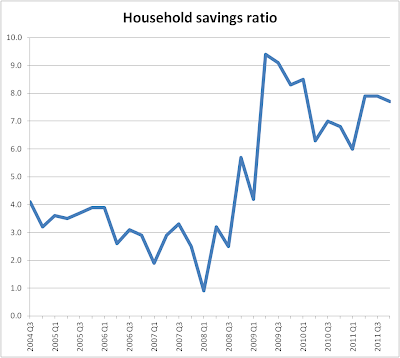 By July the it was opposite story "Savings fall as Austerity Squeezes Household Budgets." The non-government surplus is too large, we need to reduce it now before it gets out of control. "What we want to do is target the cause of the deficits, insufficient demand which I believe is the result of the overhang of debt after a period of excess private sector credit growth. What you want to do is eliminate that debt overhang by reducing the debt or increasing private sector incomes to support the debt. That’s getting at root causes." This seems consistent with what others are saying, though not of course in the government or the Bank of England! Harrison does not give his preferred solution to this problem. Mine would be direct debt relief in the form of SK's modern debt jubilee. Other options would be to use QE to directly fund investment in business. An alternate take on this is to specifically fund green business that will lessen our dependence on oil.